Things are changing in Lincoln. For the first time since 2014, fans who attend Nebraska basketball games will see a native son on the Huskers’ bench in the form of Brady Heiman, a 6-foot-11 post from Platteview High school in Springfield. The last — and first — in-state player Miles signed was former Omaha Central guard Deverell Biggs. Biggs, who spent his first two seasons of basketball at a junior college, was Miles’ first commit after he took over in Lincoln. Biggs’ enrollment snapped a decade-long streak of rosters without a player from Nebraska on scholarship. However, Biggs’ time in Lincoln was tumultuous and short as he was dismissed from the team midway through his second year in the program and first on the court (he redshirted in 2012-13). In July of 2014, Nebraska offered another in-state in player in then-2017 Omaha South forward Aguek Arop. A month later, Arop committed to Miles, becoming the youngest commit in program history. However, Arop and Nebraska went their separate ways in August of 2016. Arop spent a year at prep school and is now at San Diego State. Nebraska left his scholarship open until the second semester, when Miles gave it to walk-on Tanner Borchardt, a Gothenburg product (technically that makes HIM the first local scholarship player since Biggs, but that doesn’t really count). Nebraska’s lack of success with Nebraska players over the last several years is particularly baffling when compared to the other major Division I program in the state, Creighton. The Bluejays have had at least one local player on the roster in 10 out of the last 12 years, six players in total: Nick Bahe (Lincoln Southeast), Josh Dotzler (Bellevue West), Antoine Young (Bellevue West), Josh Jones (Omaha Central), Justin Patton (Omaha North) and Khyri Thomas (Omaha Benson). To be fair, the first four of those players committed to Creighton while the Bluejays were still in the Missouri Valley Conference while the last two, Big East recruits, went on to be NBA Draft picks. Still, Creighton identified local talent that could help the program regardless of the conference it was in, and the Jays have won with those players. Meanwhile, Nebraska has made the NCAA Tournament just once during that span. The point is, Nebraska — and Miles in particular — has not had much scholarship luck inside of Nebraska’s borders. The staff’s bad experiences (Biggs in particular) seemed to have scared them off from investing too heavily locally. Nebraska has either not shown much interest in Nebraska players or hasn’t had much success gaining a commitment from the ones they have. But that is changing. Heiman’s commitment was only the beginning. Since securing a commitment from the 2018 big man, the Huskers have also offered the top in-state prospect in the 2019 (Omaha Creighton Prep’s Akol Arop), 2020 (Lincoln North Star’s Donovan Williams) and 2021 (Bellevue West’s Chucky Hepburn) classes. Arop (the younger brother of Aguek on his own journey) plans to take an official visit to Lincoln Sept. 28-30, Williams made news this week by committing the the Huskers and Hepburn has already been to campus unofficially. A big part of the shift in recruiting strategy has been a re-shuffling of the coaching staff’s responsibilities. With Kenya Hunter leaving to take an assistant coaching job at UConn and Armon Gates replacing him in Lincoln, Miles reevaluated staff roles and placed assistant Michael Lewis in charge of in-state recruiting. Lewis was a standout player at Indiana from 1996 to 2000, leaving Bloomington as the school’s all-time assists leader and went on to play two years of professional basketball. After five seasons as an assistant at Butler, Lewis joined Miles’ staff in 2016 and has been in Lincoln since. 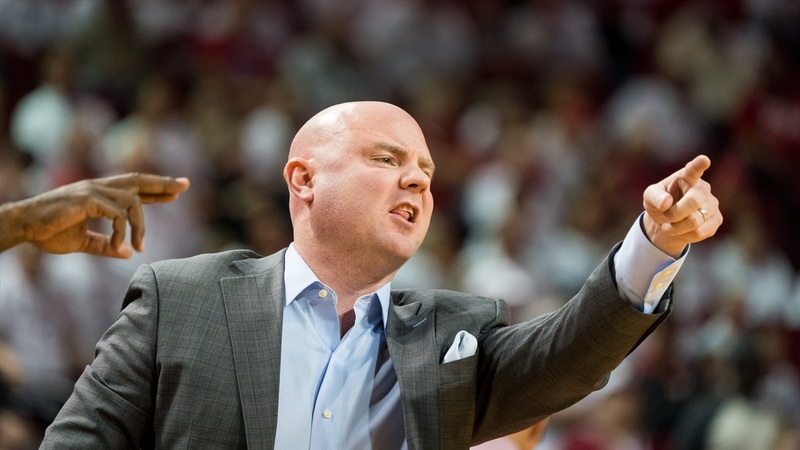 Leading up to the 2017-18 season, Miles trusted Lewis with more input in the team’s offense and the Huskers went on to post their highest scoring average in 22 years. Now, he’s tackling local recruiting. Lewis is the point man for the recruitment of Arop, Williams and Hepburn, and his increased involvement is already paying dividends. It will be interesting to track in-state recruiting battles over the next several years. Nebraska and Creighton haven’t really recruited head-to-head in-state recently. Nebraska never got involved with Patton or Thomas, and Creighton never offered Aguek Arop. Both schools offered former Papillion-La Vista forward Ed Chang early, but both also backed off of him and he ended up at San Diego State to play with Arop. Creighton showed interest in Heiman, but only offered a scholarship for 2019 that required him spending a year at a prep school while Nebraska offered him for 2018. Creighton secured a commitment from Omaha Burke guard Shereef Mitchell for 2019 after he spends a prep year at Sunrise Christian Academy, but Nebraska did not recruit him. Creighton has not offered either of Akol Arop or Williams, though Williams did take an unofficial visit to Creighton. Hepburn might be the first case of a true battle between Nebraska and Creighton for a local recruit. The Jays have not offered yet, but they’re interested. Hepburn has said in the past that Creighton is one of the schools he has dreamt about playing for, but the Huskers dived in first with an offer. There’s no doubt the the Jays have gotten the better of the Huskers on the court in recent years, but with a strong returning core and Creighton’s top two players from last year’s squad moving on, Nebraska has a chance to snap that streak. Success on the floor could lead to success on the recruiting trail as well. With Lewis running point, I wouldn’t count out the Huskers any more.